Has your skin been looking a bit, well, spottier lately? Moles, freckles, and other skin blemishes increase as we age, and sun exposure changes the way your skin looks. . In fact, more than 90% of visible changes commonly attributed to aging are actually caused by the sun. Over time, exposure to the sun can cause harmless discolorations like freckles, sallowness, and even benign tumors. But it can also cause pre-cancerous and cancerous skin lesions like melanoma. Melanoma is the deadliest type of skin cancer; one in fifty people will be diagnosed with melanoma of the skin in his or her lifetime. Early detection is essential for prompt treatment. How do you know if a mark on your skin is harmless? When should you be worried? There are a few basic warning signs that you should be on the lookout for, whether you notice an old blemish changing shape or color, or spot a new mole or freckle making its debut. 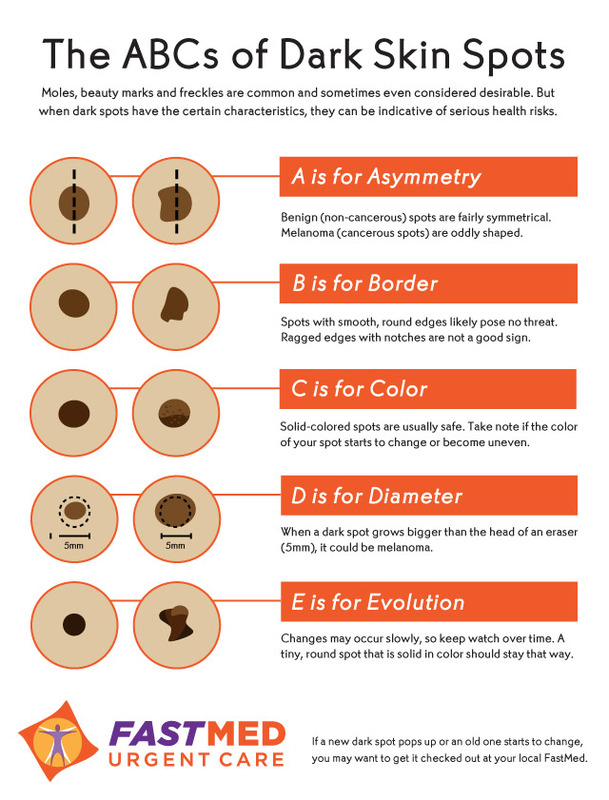 Follow FastMed’s ABCs of dark skin spots to know if you should make an appointment to see a medical care provider at your local FastMed.